I want to share my joy and gratitude over the recent honor we received from Venice Area Chamber of Commerce. I am so proud to stand out in this Chamber which consists of 882 business and 3,468 individual members. 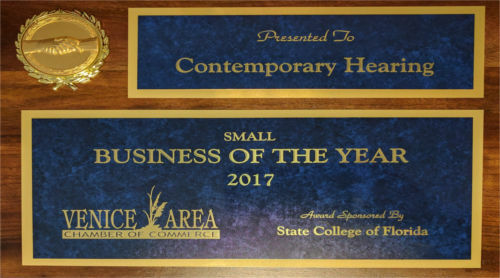 This year there were 49 Small Business Nominees, 11 Finalist, and we are the one honored with Small Business of the Year Award. The Business of the Year Award is an honor given by our local Chamber of Commerce to businesses who stand out in a variety of business areas. The two most notable areas are service to clients and involvement in our community. Our nomination was based on the consistent number of recommendations from you to the Chamber. Most of the recommendations commented about our services going above and beyond what you expected. As a nominee, we had to complete a lengthy application and go through an interview process. At the end of the nomination process we were considered one of 11 finalists. We have been finalists in prior years. Each of those years we were honored to be in a group of outstanding business owners and to recognize my inclusion in that group is humbling. This year when we stood up as one of the finalist and Karen and I realized who was also in the small business category, we were surprised that we took top honors. I started in this industry 18 years ago. I was inspired by the my mother, MaryEllen. I witnessed the frustrations she faced with her hearing loss and the services she received. I never imagined this journey would take me from that inspiration to this moment of being honored by our local Chamber. The consistent honors we have received over our years in business has encouraged and challenged us to improve our service. These awards let us know we are doing the right thing for you, our clients, and our community. From the bottom of our hearts, thank you for nominating us to our local Area Chamber of Commerce. We deeply appreciate you taking the time to share how you feel about the services you received from us. Receiving this award was an amazing moment. Thank you for your support and encouragement that helped me receive this recognition. To everyone who recommended us by sharing their experience and their testimony with the Chamber, thank you.